Being blessed with an abundance of sunshine, the valley has the perfect growing climate for fruits and vegetables. Cheers are the first to arrive, followed by apricots, plums, peaches, pears and apples. Heirloom tomatoes of every hue and shape, fragrant strawberries along with raspberries and blueberries make appearances at markets and road-side stands. Beginning in April you will find markets opening throughout the valley, all bursting with fresh fruit, veggies and home baked goods. Browse the market with friends, take in live entertainment or splurge on a locally crafted item. Every Saturday from April to October (8:30AM – 1:00PM) on the 100th block of Main Street, Penticton. 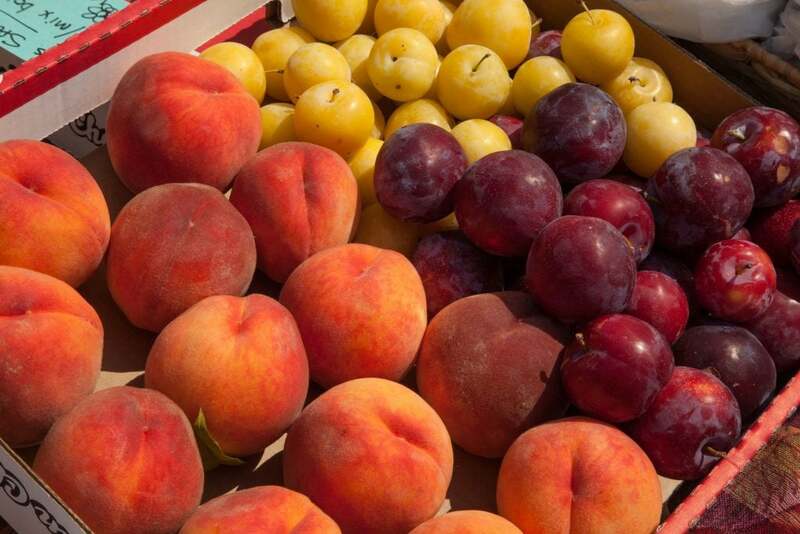 You will find farm fresh vegetables and fruits, eggs, honey, baking, preserves and handmade crafts – all grown or produced in the South Okanagan. The vendors proudly make, bake or grow everything they bring to the market and also host a selection of local liquor vendors each week. Every Saturday from May 6 to October 7, 2017 (8:30AM – 2:00PM) spanning from multiple blocks in the downtown core. The market is the biggest of its kind in the Okanagan with hundreds of vendors featuring handmade goods including clothing, food, jewelry, collectables, antiques, furniture as well as live music and entertainment. Every Wednesday June 14 to September 6 (3:00PM – 6:00PM) at Wharf Park, Naramata. Enjoy the best locally grown, crafted or produced art, baked goods, garden delicacies as well as a place to come enjoy music, performers or just hang out with your friends, neighbours and be part of the scene. Every Sunday from June 11 to September 10, 2017 (9:00AM – 1:00PM) on Main Street, Summerland. The Main Street of Summerland provides a quaint backdrop for the Summerland Sunday Market. Farmers, artists, crafters and food vendors fill over 50 stalls with the bounty of Summerland and the Okanagan Valley. The live entertainment paired with great food vendors and wineries makes this bustling market a special destination.